The Magnatab is a wonderful learning tool that provides an immersive, earlywriting lesson. Explore creating letters and numbers in a sensory-reinforcedactivity that allows children to process information and develop understandingthrough their eyes, ears and fingertips. Following the directional arrows, usethe magnetized pen to trace over the letters or numbers and the beads will popto the surface with an audible click revealing the shape. Press them back downwith your finger or the pen and start over. Made from the highest qualitymaterials, the magnet never comes out of the pens and the balls are completelyself-contained and stay securely in the board. 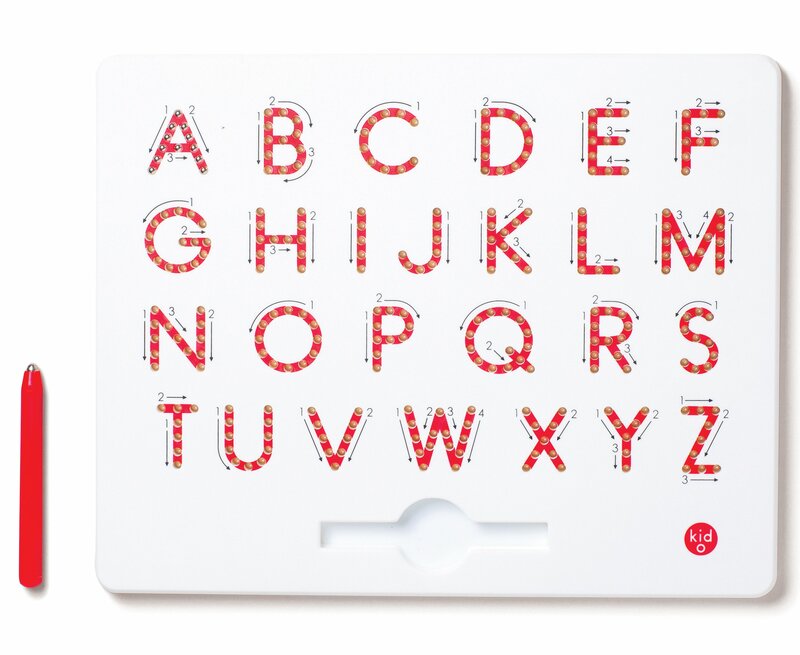 The engaging Magnatab is idealfor kids to use on their own as they learn their ABCs and 123s and master theart of penmanship. Kid O Toys, the leader in contemporary developmental and educational toys, makes learning look like child's play. Dedicated to child enrichment through toys that promote and nurture creativity and discovery, we make toys that are designed to delight and engineered to endure. With open-ended play that engage young minds, set imaginations free and celebrate a child's innate brilliance. At Kid O, safety is paramount. Always PVC, phthalate, BPA and lead free, our toys are tested by independent laboratories and conform to all US and European standards. From the Manufacturer Kids writing their first letters will get helpful up, down, and sidewaysinstructions via the easy to follow arrows. A magnetic stylus pulls the beadsup to create solid lines, and erases with the tip of a finger.